KCT 4 roller conveyors are manufactured using cold rolled mild steel side frames. The KCT 4 gravity roller track offers a 108mm x 40mm steel profile. Additional cross braces are used to increase frame strength and rigidity, allowing heavier duty products to travel along the conveyor. 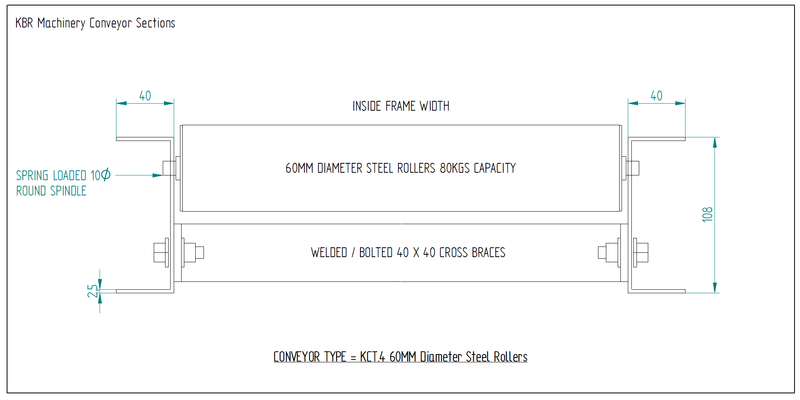 The KCT 4 metal roller conveyor has a rating of 500 kgs per meter @ 125mm roller centres. With additional frame bracing and 3mm steel versions available, the KCT 4 roller conveyor is a well built, robust and solid gravity roller track. The KCT 4 conveyor frames can be supplied in one of 3 standard colours, RAL5002 Ultramarine Blue, RAL 9010 Pure White, RAL 9005 Jet Black . In addition to the standard colour range, custom powder coated colours are available. KCT 4 gravity conveyors incorporate spring loaded heavy duty conveyor rollers 60mm diameter as standard. Drilled and tapped roller spindles are also available adding to the conveyors frame strength. The KCT 4 heavy duty gravity roller tracks are available with 80 kgs or 120 kgs heavy duty steel rollers. KCT 4 roller conveyors with 80 kgs conveyor rollers, are the upgraded version of the KCT 3 steel roller conveyor, instead using further frame bracing and 60mm diameter conveyor rollers for heavy duty applications. The heavier duty conveyor rollers also allow roller widths up to 1500mm wide. For pallet conveyors and heavy duty gravity roller tracks, it is recommended that the 120 kgs heavy duty steel rollers are used. For loads exceeding 500 kgs per meter, please view the KCT 6 heavy duty gravity roller conveyor. KCT 4 heavy duty roller track offers a medium point of inertia and medium rotation speed. Heavy duty steel conveyor rollers, offer high weight capacity and tough durability. The KCT 4 metal roller conveyors are the perfect medium duty pallet conveyor system. Ideal for medium gravity roller conveyor systems, steel cutting lines, pallet conveyors, heavy duty long spans, warehouse logistics and end of line accumulation. Where medium weight conveyor rollers are required. Minimum product size 225mm and above. Custom sections can be manufactured to include pallet curves and pallet truck conveyor ramps, adding to the versatility of the equipment. Roller centres: 75mm - 250mm. Spindle: 10mm or 15mm round spring loaded. PLEASE NOTE: Product weight should not exceed the weight capacity for the conveyor rollers. 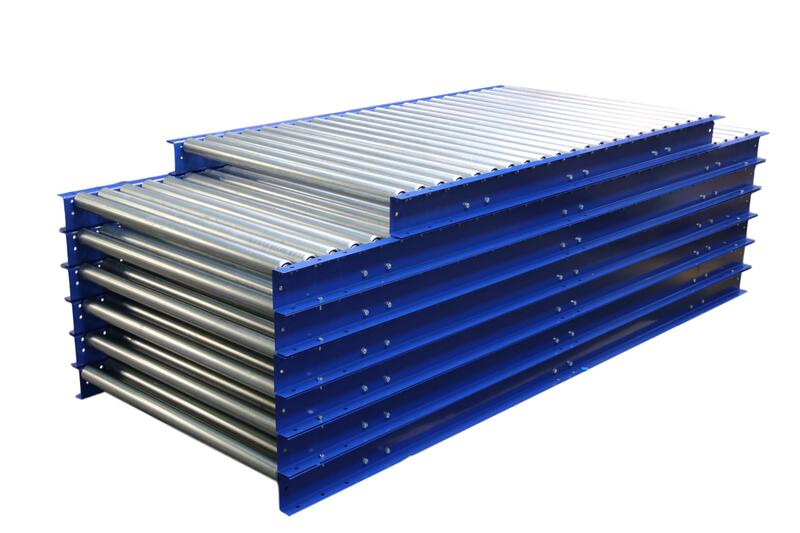 Furthermore 60mm diameter steel roller tracks have a weight capacity of 80 kgs or 120 kgs per roller at 500mm width. As a rule with every additional 100mm increment, the load capacity will decrease by 5%.